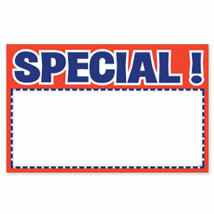 Brighten your store and increase sales with these eye-catching "Special" sign. Printed in bright red and blue. The sign is made on an uncoated white card stock. 100/Pkg.